This year’s best homage to E.T. — young teenaged boys making first contact with extraterrestrial visitors — isn’t the suburban, friendly, effects-heavy Super 8. It’s Attack the Block. In Super 8, the boys are suburban Americans spending their free time in constructive hobbies such as filmmaking and building models. In Attack the Block the boys are urban Londoners spending their free time mugging women and killing animals. Yet as no-good as these boys are, it doesn’t take long for writer/director Joe Cornish to put us in their world and on their side. But first we meet their victim, Sam (Jodie Whittaker). The five teens brandish weapons and take her purse and her ring. She manages to run away when a meteorite strikes a nearby parked car. As Moses (John Boyega), the leader of the pack, starts to check the car for loot, an animal jumps out and scratches his face. He seems frustrated, as though the mugging were unconsummated somehow, so he sets off after the animal to sate his blood lust. He kills it, then parades its corpse around the block. His friends argue over who will pay the most for the alien autopsy. The Guardian is better for their reputation, but the tabloids pay better money — a tough call. Fireworks are going off throughout the neighborhood for a holiday we Americans won’t recognize. The boys notice that some of the fireworks are coming straight from the sky, and not going up from the ground: more meteorites. More aliens. The other boys suddenly realize they have their own shot at killing an alien, and soon they’re all rushing into their bedrooms looking for weapons and fireworks, making hurried excuses to their mothers about going out so late. Their enthusiasm is genuine and infections enough to make Spielberg proud. Social workers among you will tsk-tsk that their idea of fun is killing something smaller than themselves. But writer/director Cornish understands that these boys don’t have the luxury of making super 8 films or building models. This is not suburban America, and their problems run deeper than parental divorce. Yet their driving desire is the same: they want to be a part of something bigger, and maybe take the first step toward growing up. The setting makes good subtext. The projects-dwellers have a habit of turning their violence on each other. Sam is Moses’ neighbor, and she’s not even rich, yet she is their target. We learn than Sam’s boyfriend is away in Ghana, ironically, volunteering to help the disadvantaged African youth there. The next aliens they encounter are much bigger than the one Moses killed. Instead of a little gray thing that fits on a pike, these are deep black, ape-sized beasts, with glowing teeth and no eyes. One of them faces the five youths together, and they all turn and run. Boyega as Moses conveys a lot without a lot of words. The pent-up rage from the unfinished mugging sends him impulsively after the monster. Later, after the triumph, you can see that he’s sorry he killed it. In fact, killing that first alien seems to have made the other aliens more hostile. In a scene where that possibility is raised, you can see the look of regret in Moses’ eyes. There’s regret, but there’s also a determination to accept the consequences, not just to accept the punishment, but to begin paying the debt. If you’ve seen Kim Ki-Duk’s Spring, Summer, Autumn, Winter... and Spring, you might recognize the same cycle of impulse, regret, and responsibility from that film’s protagonist. Attack the Block was made relatively cheaply, and it will be harder to find at the multiplex than Super 8 was. But a great script and tight editing make it as good a movie, if not better — although I’ll concede that it’s a little less polished. 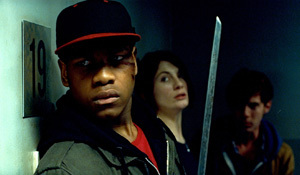 Still, If you want to get your Spielberg on — with a little more edge and a little more depth — go Attack the Block.